Hiya, Chanda here, seriously laughing out-loud as I write this post. As some of you may know, I moved out to Atascadero, CA from the coast recently. I was preparing myself for more sun and a seriously hotter summer, but this heat-wave takes the cake! On Saturday we were literally catering a wedding in 115 degree heat, standing in the sun over a fire pit. Happily I managed to not pass out, but I returned home to find that our central air was on the fritz. Cute, right? But, I can’t tell you how much I hated those shades. I get the design concept, I just didn’t want my bedroom to look like a college dorm-room. 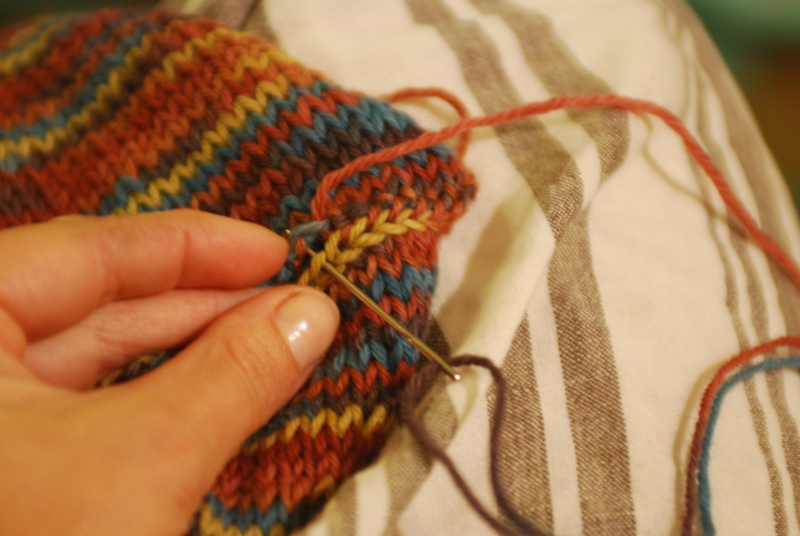 So, I dove into my boutique yarns and began to work in a stockinette stitch (aka knit one row and then purl the next, repeat). 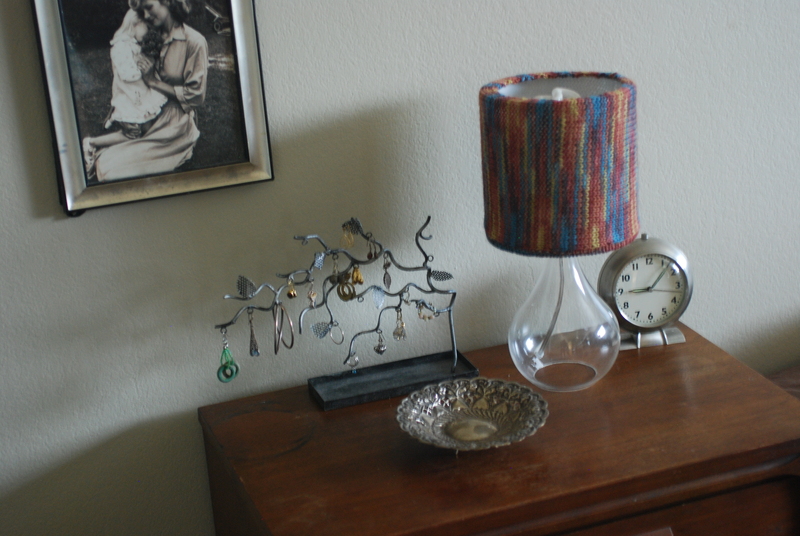 It’s important that you knit a swatch really quickly, just to gauge how many rows and stitches you would need for covering your lampshade. I estimated that I would need 35 stitches to cover the width of the shade……but everybody makes mistakes sometimes. 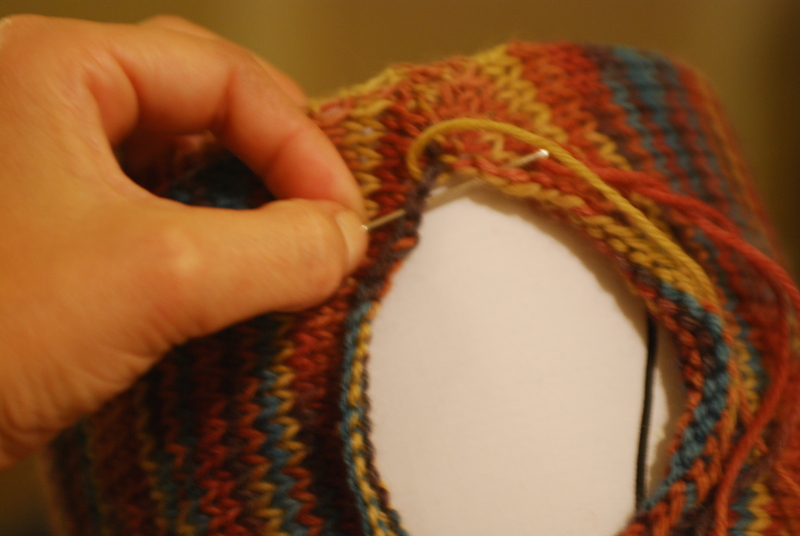 Tee-hee, no problem, I just picked up some stitches and and added some width. As you can see, this was a very organic project, so thankfully the yarn’s abstract patterning allowed for me to just go for it! 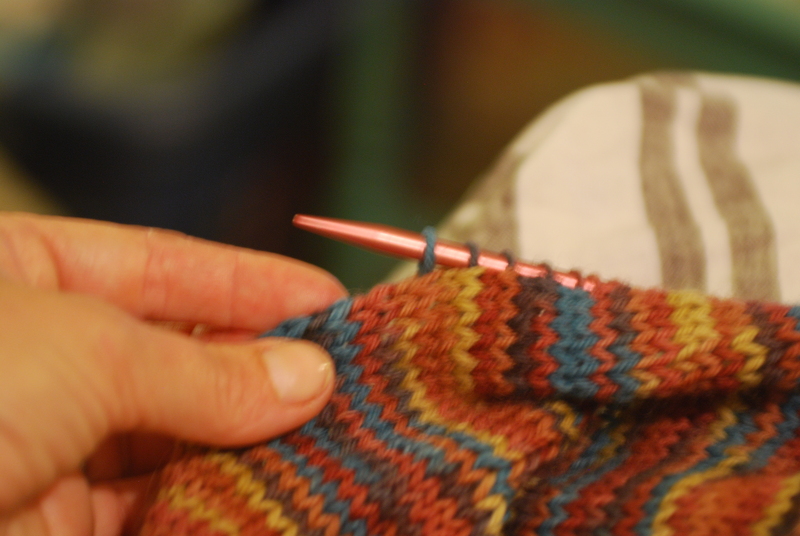 Last step was to simply sew up the seam….a easy weaving together and it was done! 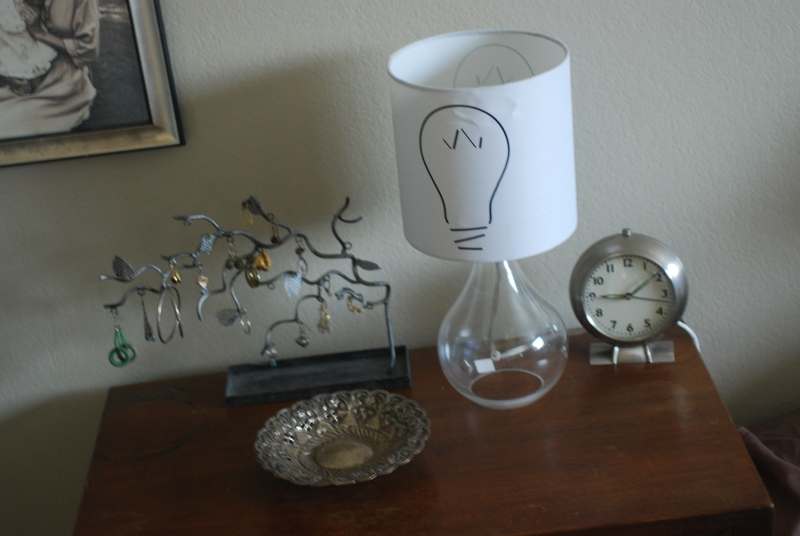 I’m totally loving the lamp now! 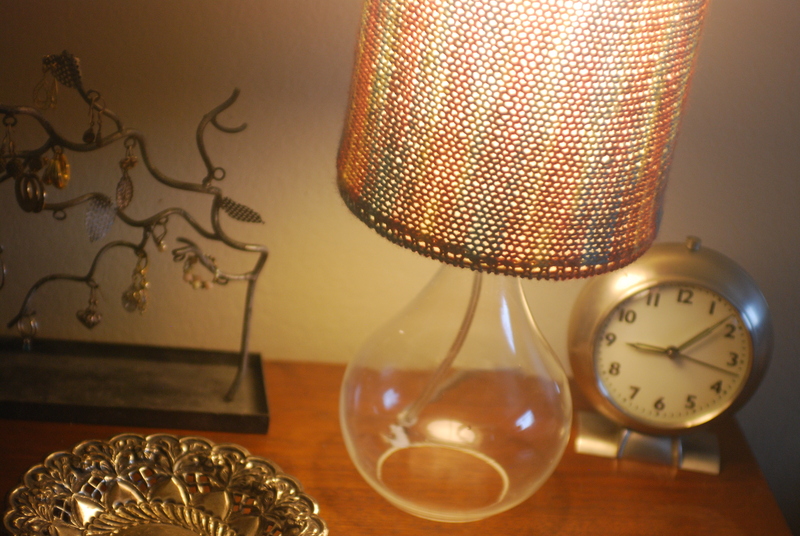 It is unique, adds a splash of color and looks great on my mid-century nightstand! The best part is how the light glows through all those beautiful colors…..
Yay! I love it when a project turns out even better than you had hoped! Ummmmm, I think I may wait til our AC is fixed before I start on the partner lamp…..perhaps working with wool when it’s 105 is just a bit too crazy, even for me 😉 Sorry hon, stylin’ your side of the bed is gonna be delayed!